What is The Correct Position Of The Tongue and the Jaw While Singing? Are Singing Lessons Safe For Kids? Practice 30 mins./day for four weeks and if you don’t hear a difference in your voice, return the Singingbelt System within 60 days for a full refund. Ruth Gerson had toured the world as a singer/songwriter, sold over 75,000 records as an independent artist and appeared with her band on “Late Night with Conan O’Brien,” before she ever dreamed of creating the Singingbelt. “The Singingbelt itself was created in the classroom, out of necessity. I had always enjoyed teaching and coaching other singers and songwriters privately, as I pursued my own career. I became the to-go-to vocal coach in NYC for singers who were suffering with vocal strain. I eventually expanded to teach many classes. I founded the “New & Used” Songwriters’ Collective and taught “Voice, Performance and Songwriting” as a Forbes College Fellow at Princeton University. When teaching large groups, it wasn’t always possible to use my hands to show voice students how to expand the lower core to control the diaphragm, as I did in private singing lessons. I needed to create something that would work as a teaching aid for singers. “Teaching singers to breathe and support their voice correctly with their diaphragm is the first important singing lesson a good vocal coach needs to convey. Singing begins and ends with the breath. You have to learn to control the breath for everything else to work. Because the diaphragm is inside your body and it can’t be seen, and because air is invisible and its mass can be difficult to feel, I often used my hands to help convey the feeling of diaphragmatic breath support to vocal students. 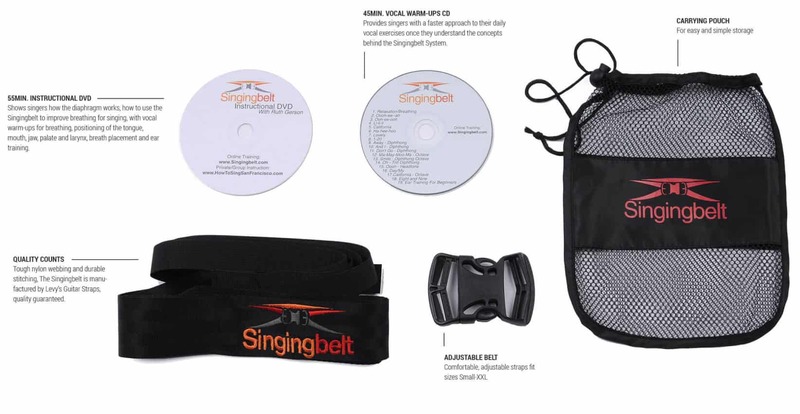 The Singingbelt was a big breakthrough when I didn’t have enough hands to go around and I also knew singing students would benefit greatly from having a vocal training device they could use at home on their own when practicing daily vocal warm-ups. “I cut and sewed the first Singingbelt out of an old pair of jeans. The material was maleable, so I could get the right contours to adjust to people’s varying shapes, but it was too flimsy and stretchy to use more than a couple of times and the fastening system was cumbersome and uncomfortable. It also did not stay in place very well. “I have been so pleased at the product we’ve developed with Levy’s guitar strap manufacturers in Canada. It is the perfect design created out of the perfect material. Every student who walks into my studio puts it on, and within minutes of a lesson, they have an “Oh!” moment. It is very rewarding to watch singers, some who may have taken singing lessons their whole lives, find their voice with so much ease. It is a wonderful moment as a singing teacher to be able to give your students that much confidence in their voice. What is included in The Singingbelt System? 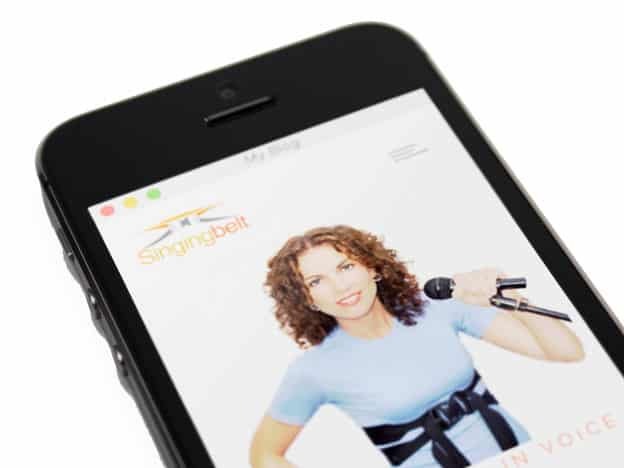 The Singingbelt A revolutionary device in vocal training invented by star vocal coach Ruth Gerson. The Singingbelt was created in the classroom to teach singers how to use the diaphragm, support the voice and master breathing for singing. A 55min. Instructional Video Shows singers how the diaphragm works, how to use the Singingbelt to improve breathing for singing, with vocal warm-ups for breathing, positioning of the tongue, mouth, jaw, palate and larynx, breath placement and ear training. A 45min. Vocal Warm-ups Digital Download Provides singers with a faster approach to their daily vocal exercises once they understand the concepts behind the Singingbelt System. The Singingbelt is adjustable and will fit sizes XS to XXL, or approximately persons 80lbs. to 280lbs. If the Singingbelt doesn’t fit you, you can return it for a full refund. ‎‏No, the Singingbelt is a manual device that lets you know if you are maintaining or losing breath support through the sensation of its firmness. The Singingbelt System is a comprehensive vocal training program that addresses breath support, breath placement, positioning of the tongue, mouth, jaw, larynx and palate, and ear training. The Singingbelt System’s first emphasis is on breathing correctly for singing, with the idea that if you are not breathing correctly, no matter what else you do, you will not gain full control and freedom of the voice. Once you learn to breathe right for singing, everything else gets easier. Yes, the Singingbelt instructional video is aimed towards all levels of singer experience. More advanced singers may only need to watch the video once, before speeding up their practice using the vocal exercise CD. If you are a beginner singer, you may want to use the video for a couple of weeks before moving on to the CD. If you have further questions, we’d be grateful to hear them and will often be able to answer them with a video. Please email questions to info@singingbelt.com. I’ve been singing for years and have trained in voice will the Singingbelt help me? Yes, even the most advanced singers will find the Singingbelt System breathing and singing exercises helpful. Try it for 30 days, and if you don’t think your breathing and singing technique have improved, return it for a full refund. Can I use the Singingbelt on a child? The Singingbelt is not recommended for children under the age of 14. Can I wear the Singingbelt while I perform? This is not recommended. 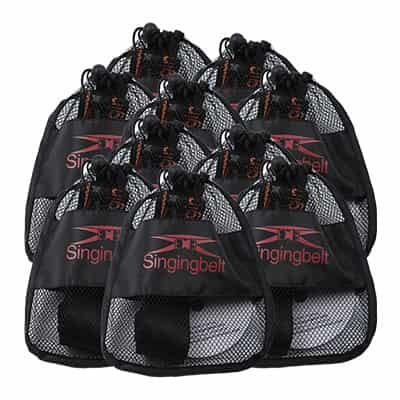 The Singingbelt should not be worn for more than an hour a day while training. How tightly should I wear the SIngingbelt? It takes a few moments to find the sweet spot of how tightly you should wear the Singingbelt. It should not be so tight that it makes expansion of the lower core difficult, but it should not be so loose, that the singer feels a need to expand unnaturally to keep it in place. Generally, it should feel snug with enough give to place a finger underneath the top strap. How do I know if I am wearing the Singingbelt correctly? Make sure you watch and review the assembly and fitting portion of the instructional video. The top belt (with the logo on back) should fit at the bottom of the sternum, mid-rib cage. The lower belt, which tapers upwards towards the sternum, should hit the lowest rib on both sides. The belts and buckle should not cross or constrict the abdominal wall muscles. The belly needs to remain free. When will I hear a difference in my voice? Some singers notice a difference within the first few days of training with the Singingbelt System. They are able to stop the voice from shaking, sustain a pitch, have more power and relieve vocal strain from the get-go. The Singingbelt guarantee, is that if you practice 30mins/day for four weeks, you’ll hear a difference in your voice. Make a simple recording of a song (even using voice memo on a phone), before you start your Singingbelt System training, then record that song again in each week for four weeks. If you don’t hear a difference, return the Singingbelt for a full refund. Are there additional Singingbelt videos I can buy? There are additional Singingbelt videos you can use for free on the Singingbelt Youtube channel. I am a vocal coach myself. 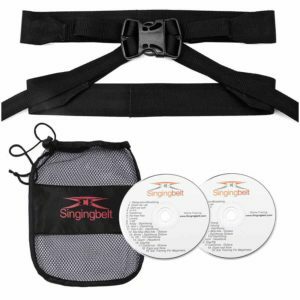 Can I train and become certified to teach the Singingbelt System? You can absolutely apply to certify and teach the Singingbelt System. Please email info@singingbelt.com for more information. Is there a Singingbelt class I can take? There is the “Sing Better In A Day!” Singingbelt System one day voice workshop. It is taught periodically in major cities, at schools and universities across the U.S., and most often in the Bay Area. If you are interested in finding out more, or bringing the workshop to your school, choir or other organization, please email info@singingbelt.com. Is it possible to get private coaching from Ruth Gerson? Yes, Ruth teaches privately in the Bay Area and also over Skype or Google+. Please email info@singingbelt.com for more information. "Holy S**t! This worked so fast. Everything just opened up. I studied with Seth Riggs, Don Lawrence - all the top people in NY. Holy S**t! I just found this so helpful. I suffered with scarring on my vocal cords and I’ve made a lot of changes to get things back and this one thing just helped so much! Thank you, Ruth!" One of the top vocal coaches in NYC for many years, Ruth Gerson has taught voice, songwriting and performance at Princeton University. She currently runs San Francisco Vocal Coaching and also teaches at Blue Bear School of Music and The Music Center in San Francisco. As an independent artist, Gerson has appeared on “Late Night with Conan O’Brien,” “The Late, Late Show with Craig Ferguson,” the entertainment news show “Extra,” PBS, Showtime, HBO and Lifetime television. She has performed at the Newport Folk Festival, New Orleans Jazz & Heritage, High Sierra Music Fests and many more. Her career has included vocals on many popular jingles, as well as back-up vocals/keyboards for Gloria Gaynor. Her latest album Deceived is produced by five time Grammy winner, Rick Chertoff and William Wittman. Gerson has opened for Dave Matthews, Lisa Loeb, The Indigo Girls and Steven Wright. Gerson moved to the Bay Area in August of 2009 and has rapidly become one of the most in-demand vocal coaches in San Francisco and on the Peninsula. Finally understand how the diaphragm works and sing freely with the first device that improves breath support - the foundation of vocal technique. 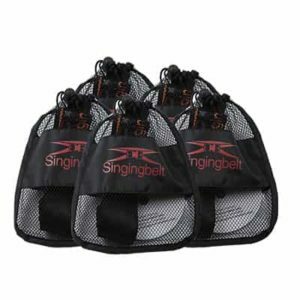 Practice 30 mins./day for four weeks and if you don't hear a difference in your voice, return the Singingbelt System within 60 days for a full refund.